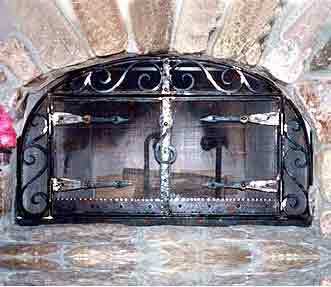 Backed with great experience, we are reckoned as one of the reputed manufacturers and suppliers of Wrought Iron Fireplace Screen. These are manufactured by a team of experienced craftsmen by using advanced technology and superior quality wrought iron. We provide these in various sizes and specifications to meet the diverse necessities of the clients. Designed using galvanized wrought iron, this fire screen is placed in front of fireplace to protect the room from open flames & flying embers emitted by fire. Vivacious colors and sophisticated embroidery makes the assortment of Wrought Iron Fireplace Screen very striking and eyecatching. Description : Amazing blend of strength and charm! These wrought iron fireplace screens are sure to last for a long period of time manifolding the decor of your interior.